Video: Aerial footage of the split in the Larsen C ice shelf taken at the start of the year. Antarctica boasts a great many superlatives: it is the driest continent, the coldest, the remotest, the windiest and the highest on average. Right now, during midwinter, it is also the darkest. As a rift on the continent’s Larsen C ice shelf lengthens and gets closer to the ice front, we are anticipating the detachment of a large tabular iceberg within the next few weeks. This comes after observations of a waterfall on another ice shelf last summer, reports of extensive surface melting on several ice shelves and, in a report last week, indications of a widespread surface-melting event, which included rainfall as far as 82° south, during the 2015-16 El Niño. Are glaciologists shocked by any of this? Is Antarctica going to melt away? Is Larsen C about to collapse? The answer to these questions is no. Glaciologists are not alarmed about most of these processes; they are examples of Antarctica simply doing what we know Antarctica has done for thousands of years. But because there is a potential link between the ice sheet and climate change, glaciologists are suddenly faced with a situation where the spotlight is on our science on a seemingly daily basis, and every time a crack grows, or a meltstream forms, it becomes news. The situation is a conundrum: we want people to be aware of Antarctica and concerned about what might happen there in the near future as climate changes. But hyping research results to sound like climate change, when they are just improved understanding of natural behaviour, is misleading. To understand all of this, we need to think about how Antarctica works. The ice sheet stores 90% of Earth’s freshwater, which would translate to about 60m of sea-level rise around the globe if it all melted. If Larsen C were to disappear, its tributaries could contribute about 1cm to the global sea level. The ice gets there through snowfall, just like the ski slopes at Chamonix, but, in Antarctica, with annual average temperatures ranging from -5C to -60C, most of the snow that falls over winter remains at the end of each summer. Over millions of years, snowfall has been added, buried and compacted by new snowfall, and an ice sheet has grown. Once the ice is thick enough, it flows downhill towards the ocean, where it lifts off the ground and floats, forming an ice shelf. In contact with the ocean below and the atmosphere above, this is where the “rubber hits the road”: to maintain its size, the ice sheet must shed the extra ice it gains through snowfall, which it does through two processes that both occur at the ice shelves – calving of icebergs at the front, and melting underneath. Ice shelves also hold back the flow of the grounded ice; if shedding from ice shelves exceeds the gains from snowfall, they will shrink, and then glaciers feeding them will feel less resistance to flow and speed up, and sea level will rise. There is plenty going on that merits concern: Antarctic ice shelves overall are seeing accelerated thinning, and the ice sheet is losing mass in key sectors of Antarctica. Continuing losses might soon lead to an irreversible decline. However, we do not need to press the panic button for Larsen C. Large calving events such as this are normal processes of a healthy ice sheet, ones that have occurred for decades, centuries, millennia – on cycles that are much longer than a human or satellite lifetime. 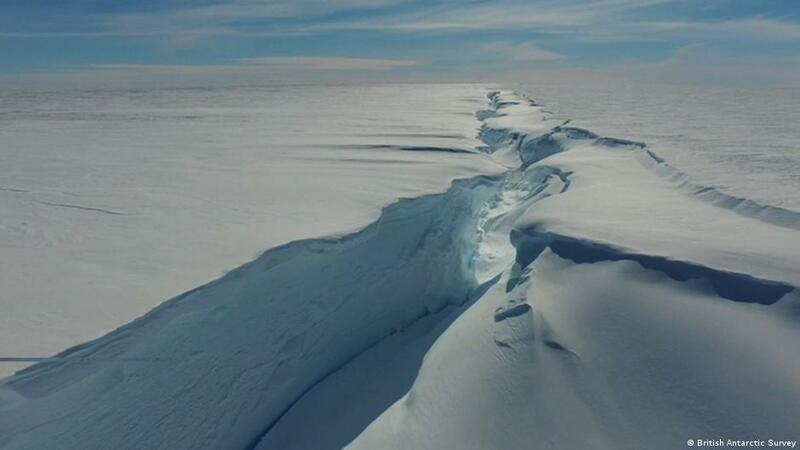 The Larsen C rift is like a dozen other rifts observed in Antarctica before. What looks like an enormous loss is just ordinary housekeeping for this part of Antarctica. An iceberg, even one as large as Delaware or a quarter of the size of Wales, is small compared to the whole ice sheet, which averages 1.4 miles thick and is larger in area than Australia. Think of it as one grain in a bag of rice. Similarly, waterfalls off the front of the ice shelf are not a catastrophe. Surface melt is common and occurs every summer as temperatures rise above 0C, as reported in papers published in the 1990s.